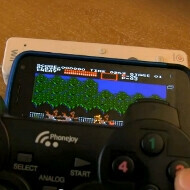 This epic 17-minute video below can teach you a trick or two on how to use your Android smartphone as a gaming console, complete with installing emulators, hooking it up to a TV, as well as using various accessories like gamepads and Wiimotes with it. For those of you who are big fans of the retro big box gaming, installing emulators and loading games up, although controversial in terms of copyright and such, is also demonstrated. The good thing about Android emulators is that you don't need to hack or root your device in any way, so Google's mobile OS is quickly becoming a gamer's lust, as hinted by the record-breaking donations to the Kickstarter project for Ouya - the open-source Android gaming console. An SNES emulator accounted for most of my time wasted on my xoom. Hope that PSP games will be compatible soon w/ Android. Sony might have to shut down PSPs considering the advancement in cell phone chips.